Including a talk with Nick Miller on the exhibition. The Arts Department of Wexford County Council in partnership with Wexford Arts Centre are delighted to host an exhibition of work by renowned and celebrated Irish based painter Nick Miller. The exhibition in the County Buildings will present a selection of Miller’s larger scale landscape works from 2004 to 2013 from both the acclaimed Truckscapes and Yard series, including a number of works not seen in Ireland before. In portraiture, still life or landscape, Miller works from the same simple premise; that he encounters his subject directly through the act of painting, and that the resulting work is seen to be the remains of that meeting. His work has an intense physicality that reflects the energy he brings to the painted encounter and the demands of addressing present reality. His work feeds off that intensity, and attempts to hold the urgency of that intangible connection to his subject in paint. He began using a converted truck as a mobile studio in the late 1990’s as a way to facilitate working on a large scale, protected from the elements, in the Co. Sligo landscape where he is based. The resulting Truckscapes have been shown across the world to critical acclaim. Since 2009, the truck from which they were painted, has sat immobile in what may be its final resting place; a steel yard at the back of his current studio, in the lee of Sligo’s Ben Bulben, the imposing and iconic mountain. More recently, the decommissioned truck itself has become a subject, along with the piles of metal that surround it. 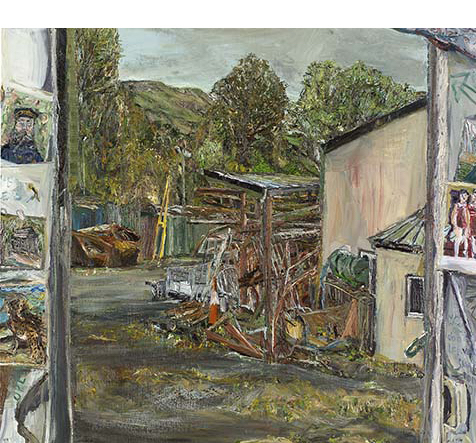 In the recent Yard paintings, the artist has started to address the view from his studio door as well as repeated views of the mountain from the truck’s now static position. In the contrast between metal and nature in Miller’s work, we are really confronted with wider questions of our relationship between culture and nature. The repeated cycles of life, growth and death are closer to real permanence than metal or machine. Beauty is found equally in the rusting man-made remnants of human construction, and in the rising mountain landscape of Ben Bulben. But in Miller’s work the pervading intensity of the natural world seems always to hold dominance over our temporary endeavours. We sense from the paintings, that whatever we do or try to do, it will, given time, be re-absorbed by the natural world. Miller’s drawings and paintings often have a natural and unstructured quality. He presents us with a sincere and recognisable vision of land rather than idealistic or romanticised imagery. His primary interest remains not in perfection of the image, but holding in paint the energy of his subject and the perceived reality of the time based encounter. 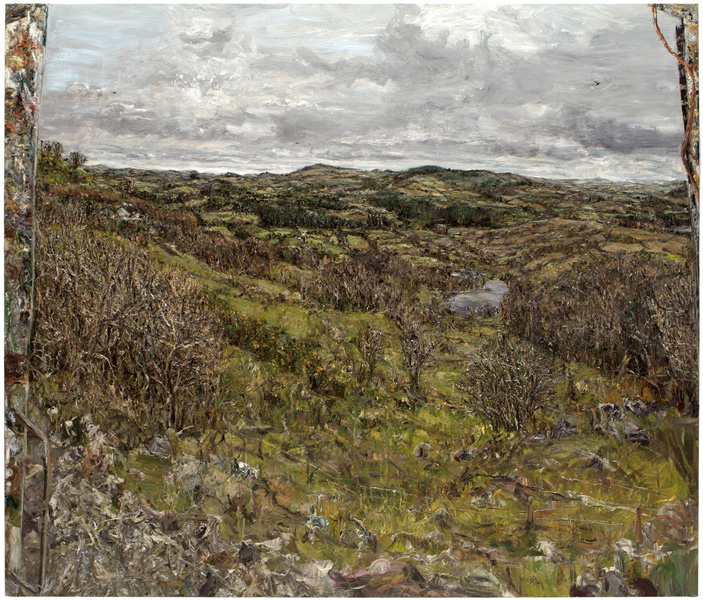 His commitment and approach to painting has given Miller’s work a unique place in contemporary Irish Art and an acknowledged place in the historical canon of work addressing Irish landscape and the West of Ireland. Nick Miller was born in London and attended the University of East Anglia, graduating in Development Studies in 1984. He moved to Ireland in 1984 and has been a member of Aosdána since 2001. He has lived and worked in Co. Sligo since 1992. In 2014, Miller won the inaugural Hennessy Portrait Prize at the National Gallery of Ireland, and his work is featured in various national collections such as IMMA, The Hugh Lane, The Niland Collection and the National Gallery of Ireland. Selected Works 2004-2013 will run in Wexford County Council from Monday 19th October to Friday 20th November 2015, and opening hours are 9.30am-5.00pm from Monday to Friday. For further information on the artist or exhibition please click here or contact Philip Knight, Assistant Staff Officer, The Arts Department, Wexford County Council, Carricklawn, Wexford on 053 9196369 or email philip.knight@wexfordcoco.ie. Copyright © 2015 Wexford Arts Centre, All rights reserved. Hello. We are keeping you informed about upcoming events at Wexford Arts Centre.